Last night I was going through my older files looking for a document from long, long ago. Back in the day when disk space was at a premium I used to ZIP up my files on a pretty regular basis. On the Windows platform I evolved through a great many different utilities, from Arc through PKZip, WinZip and finally WinRAR. So I started looking around for a simple tool to pull files out of older ZIP archives – ideally something that didn’t make me unzip the entire thing. I saw that a number of people recommended StuffIt Deluxe but at $79.99 that just seemed far too much for what I needed. There is of course StuffIt Standard and even the free StuffIt Expander but all looked a little heavy for my needs. 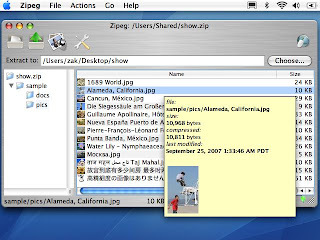 I did a little searching and found a really nice little application called Zipeg. Though it’s just a tool for expanding archives (you cannot create them with it), I found it perfect for my needs. It’s a free utility that makes it really easy to see the contents of a ZIP file and only pull out what you need – or the entire archive. You can always create a ZIP file directly in OS X by following these directions so the fact that Zipeg can’t create a ZIP file is really no big deal for me. The important part for me is that it was able to pull out the data I needed when I needed it, without any errors. The first step to setting up the right Windows environment is making sure you have enough memory. The minimum I have found to be acceptable is 4MB, though 8MB is preffered. Before the people that only have 1 or 2 MB’s of RAM fall off their chairs, remember that memory is, as of this writing, down into the $50/MB range. It is money well spent. OK, at $50 / MB the 12GB I just planted into my Mac Pro would have cost $600,000. At that time the biggest hard drives that mortals could buy for their PCs were drives that held about 300MB and cost nearly $1,000 (usually people went with 120MB drives in the $375 range). Translate that $3.33 / MB into the 1TB drive I just bought and the cost would be $3.3M. Maybe it was better not being able to open that old document.